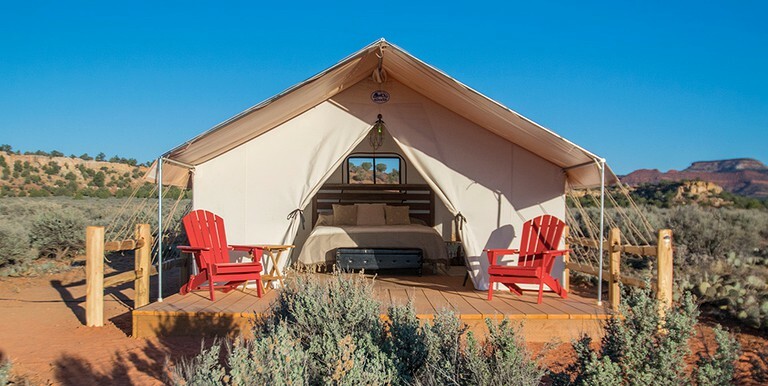 Located alongside the Grand Staircase-Escalante National Monument in Utah, these beautiful camping rentals make the perfect glamping escape! They all offer California king-size beds and are 14 feet wide and 16 feet long. 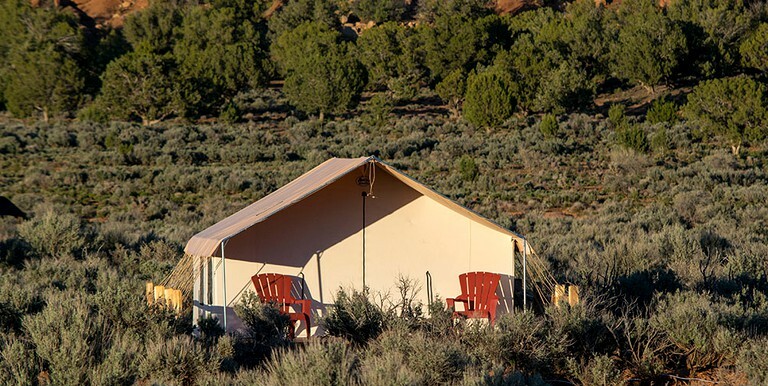 Glampers who stay in one of these tents will enjoy cozy linens and furnishings, plenty of privacy, and close access to the shared facilities on-site. 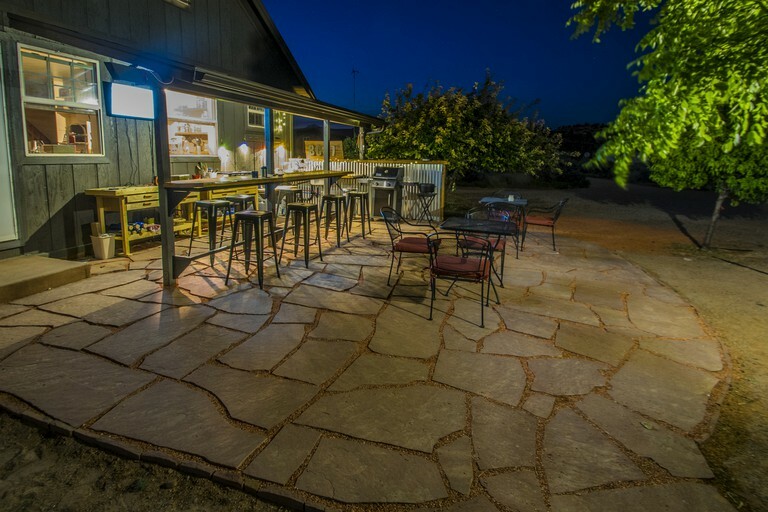 Shared facilities include two washrooms, a living room, a map library, indoor and outdoor kitchens, and an outdoor BYOB bar and fire pit (firewood and s'mores provided!). Guests can also park their vehicle right alongside the tent. 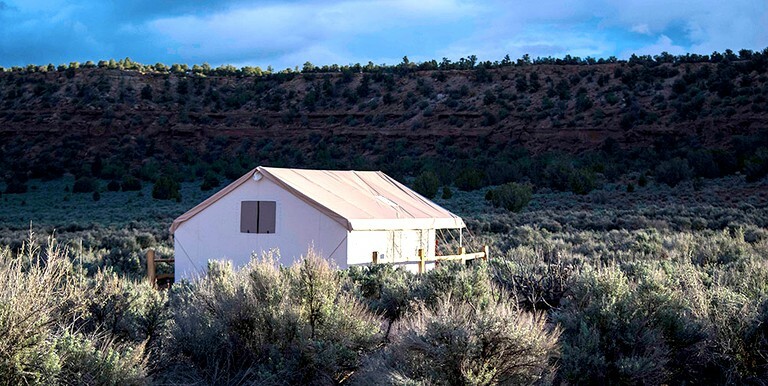 This elevated tent is the most secluded rental offered on this property and is only 100 yards away from the restrooms. It can sleep up to two guests, is perched on a raised wooden platform and comes with a private deck, with views of the surrounding valley. There is electricity for guests looking to charge their phones or laptops. There is seating, a small table with headlamps and mini cooler. 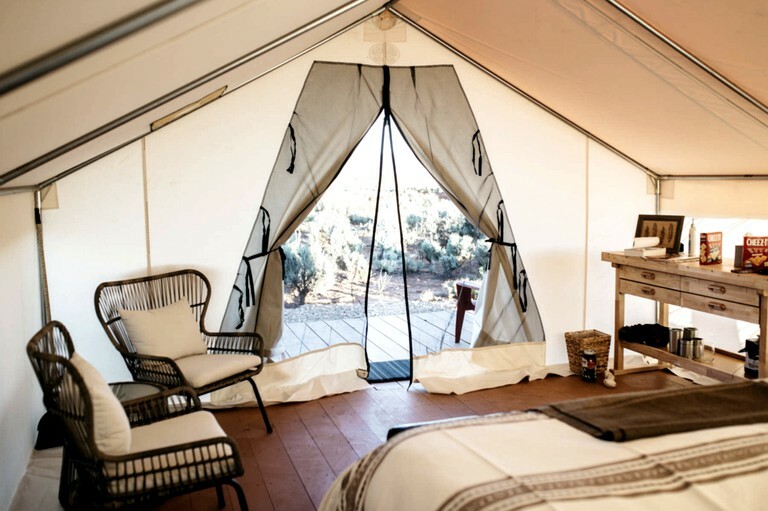 This tent is pictured in the first four photos. 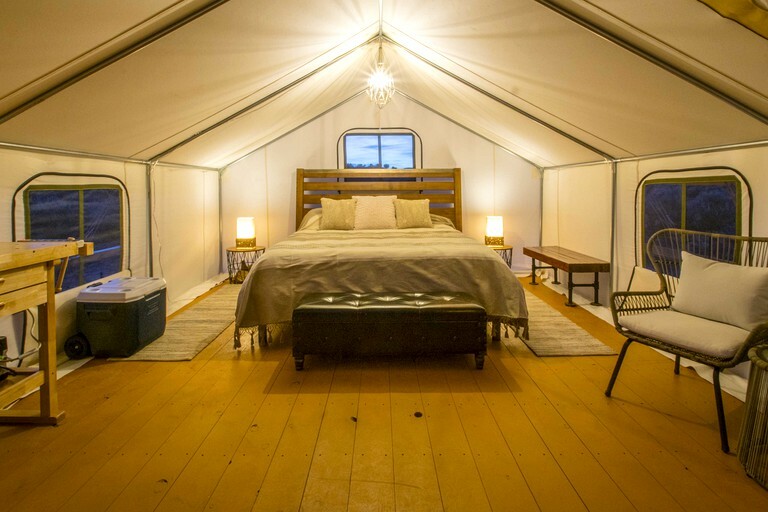 This grand glamping tent comes with a classy interior with all the necessities. 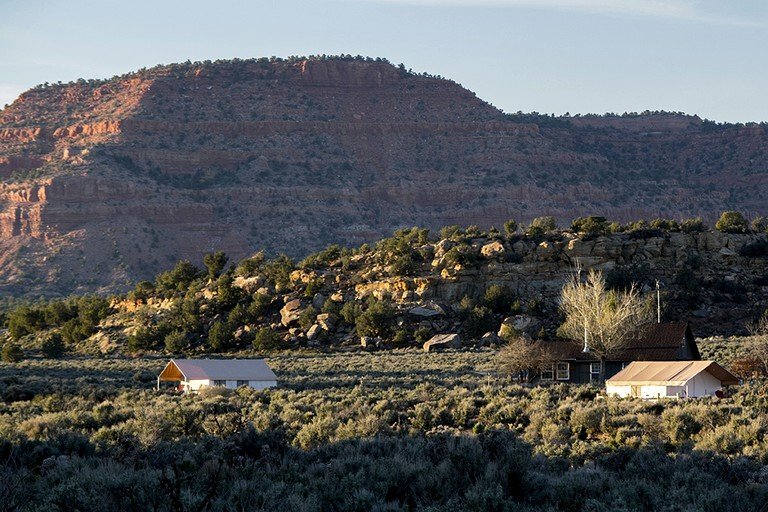 It is also furnished with a king bed, can sleep up to two guests and offers a southwest view of the Chocolate Cliffs. Set about 65 yards away, it is a bit closer to the restroom facilities than the Powell Tent. Guests will enjoy a fun, funky decor and interior, as well as plenty of comfortable features such as a large dresser, seating, and space for prepping meals. 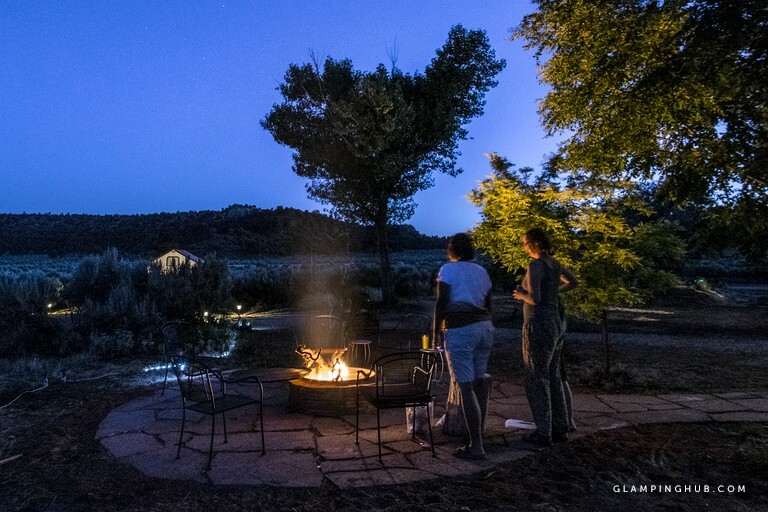 Glampers can park right next to the tent, charge their phones with solar electricity, and enjoy the outdoor grills and campfires on-site. 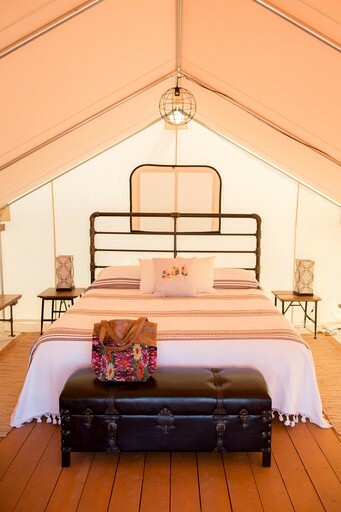 This tent is pictured in the last five photos. 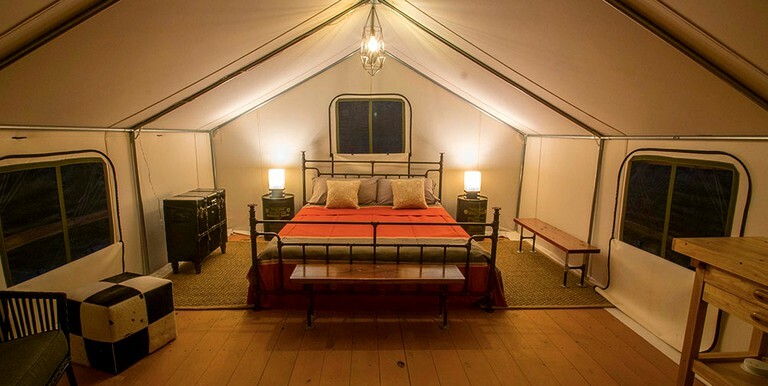 This lovely luxury camping tent for two comes complete with a comfy, king-size bed. 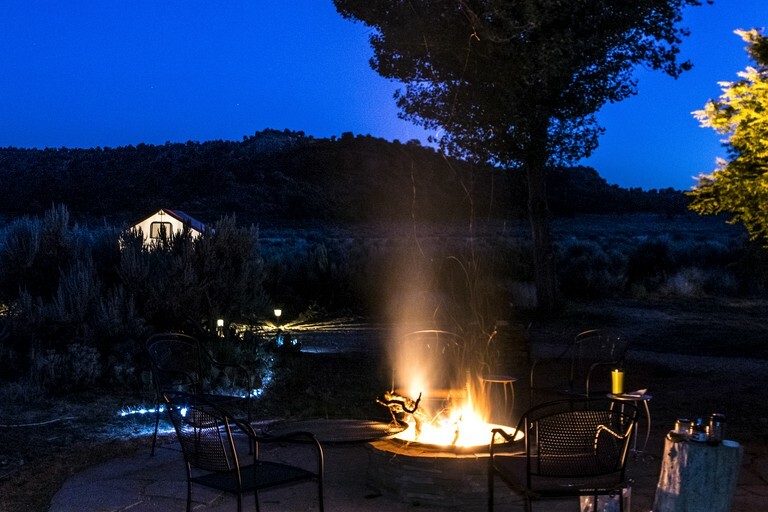 The tent is on top of an elevated wooden platform that includes a porch with outdoor furniture for sitting and enjoying the stunning Chocolate Cliff views all throughout the day. 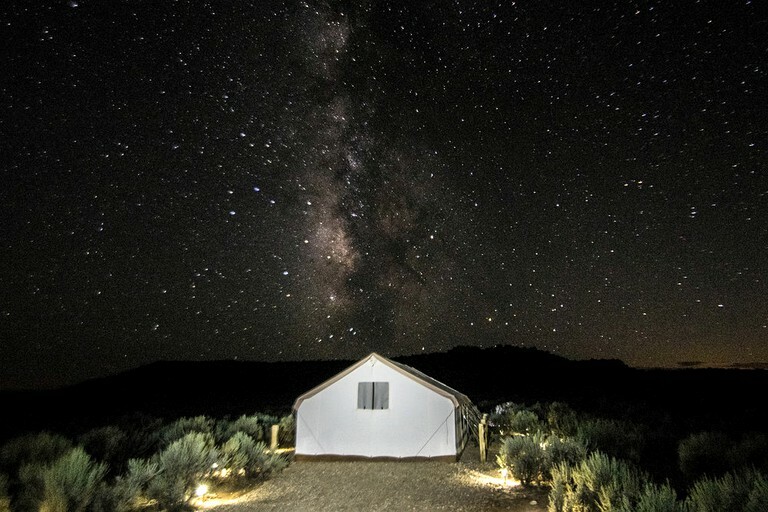 Inside the tent, glampers will find that they can charge their phones, laptops, and cameras with ease, thanks to the accommodation's solar-powered electricity. 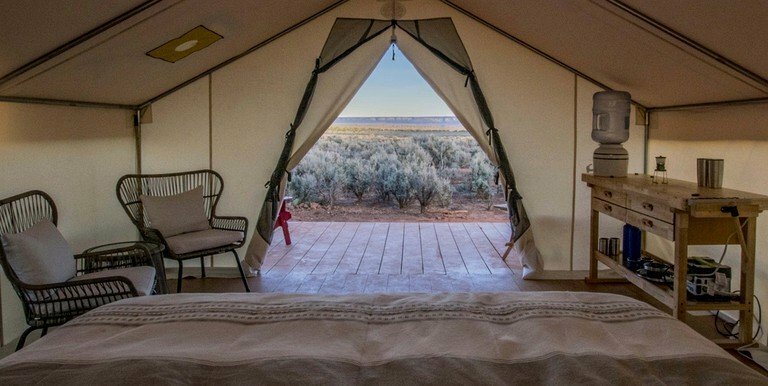 All linens and towels are provided, as well as a small cooler with ice packs, insulated drinkware, headlamps for nightly adventures or trips to the restroom, as well as a large dresser. 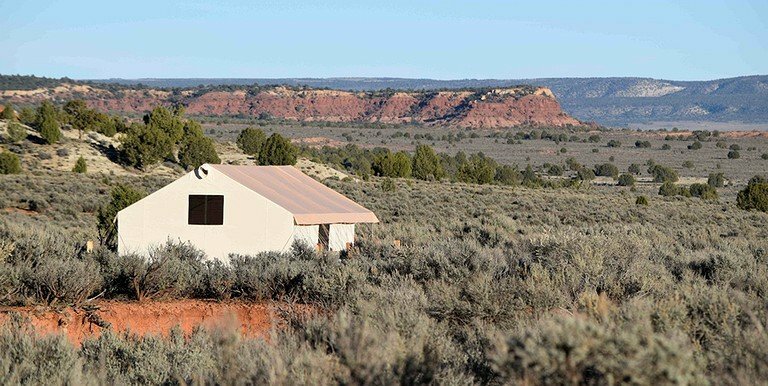 This property is a secluded, yet completely connected glamping hideaway. 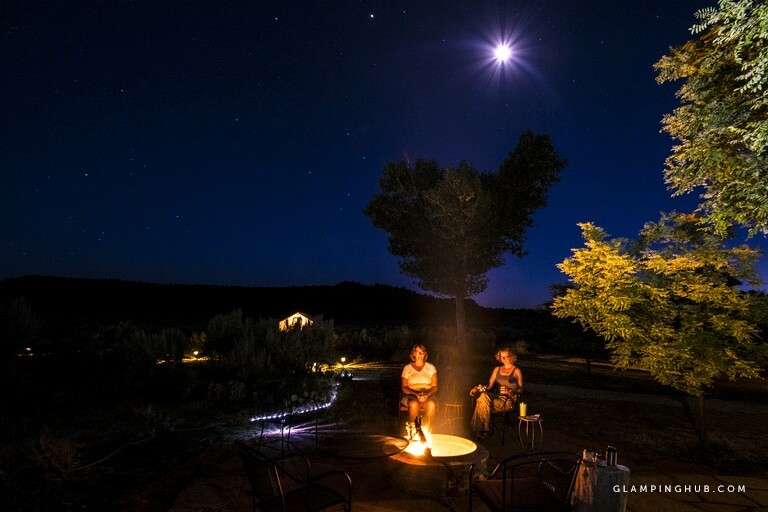 Glampers will enjoy luxury features including quality beds and linens, hot shower facilities and multiple outdoor grills. 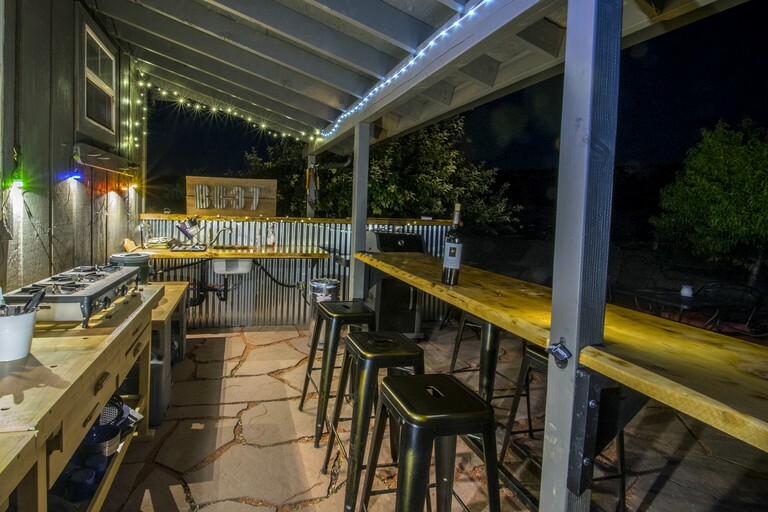 There are an outdoor kitchen and a small indoor kitchen for guests' use. 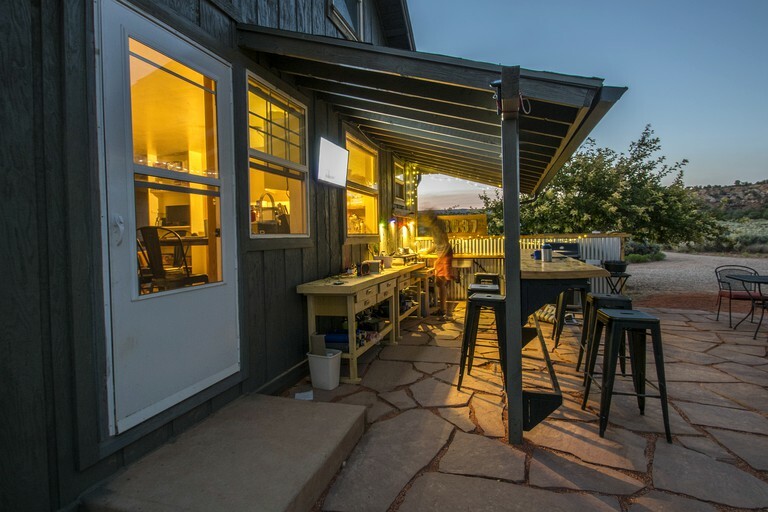 This property also offers solar power lighting and electricity, wireless internet and insulated drinkware. 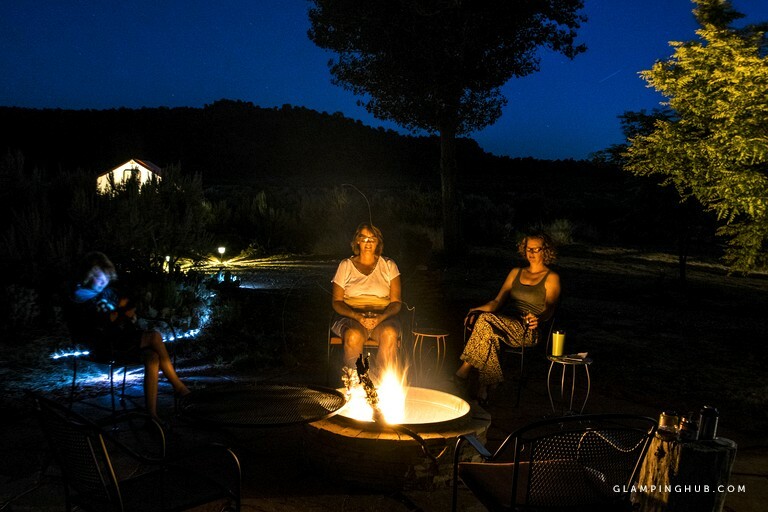 This property has a 'Bring Your Own Bar' policy and encourages guests to mingle, enjoy the campfire on site and enjoy the fun nightlife of the camp! Glampers will also be provided with a small cooler with ice packs. With all of the natural wonders located nearby, guests will have a hard time choosing where to go first! 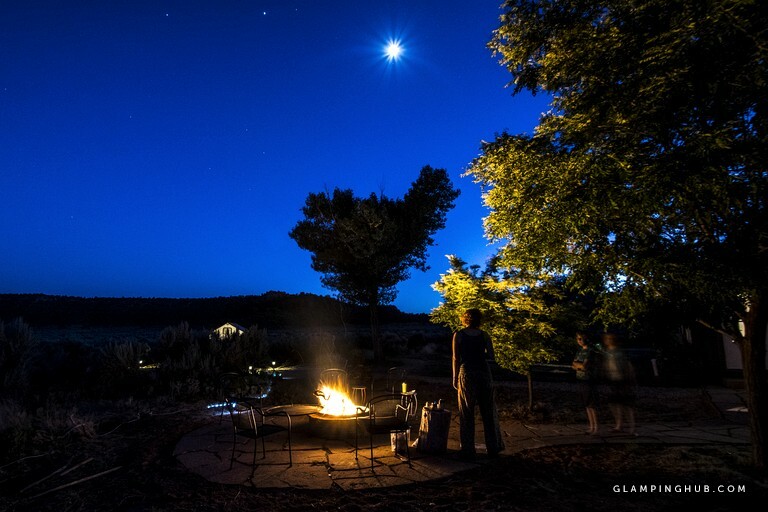 Head to the Grand Staircase-Escalante National Monument and see the Grand Staircase, an immaculate natural structure of sedimentary layers, stretches from the Bryce Canyon National Park to the Grand Canyon National Park and is made up of various cliffs and summits, perfect for a day hike or simple catching the sunset! 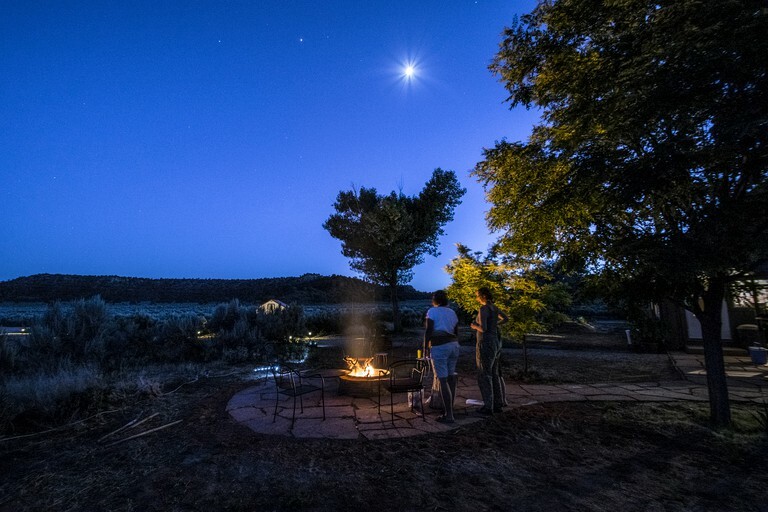 While guests are at it, discover the Kaiparowits Plateau and the Canyons of the Escalante. Additionally, guests can enjoy plenty of activities right on site! 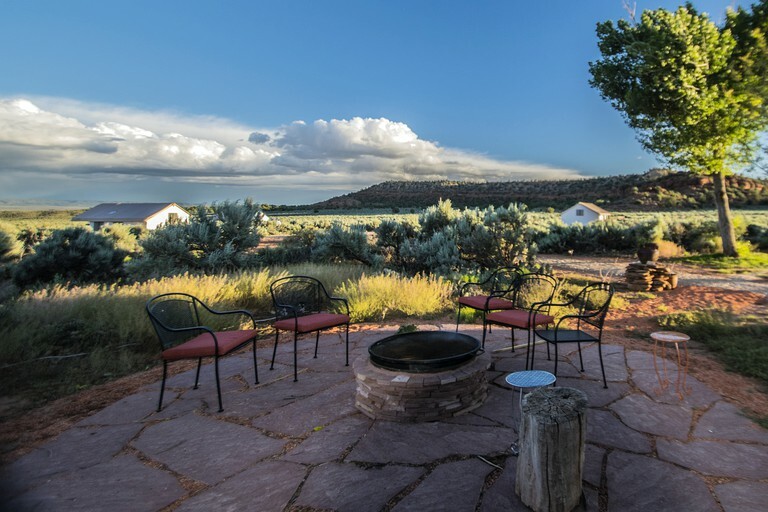 This property offers the most scenic dart board and bocce court in Utah. There are board games, cards, s'mores for fixing, even a map library for planning the next adventure! 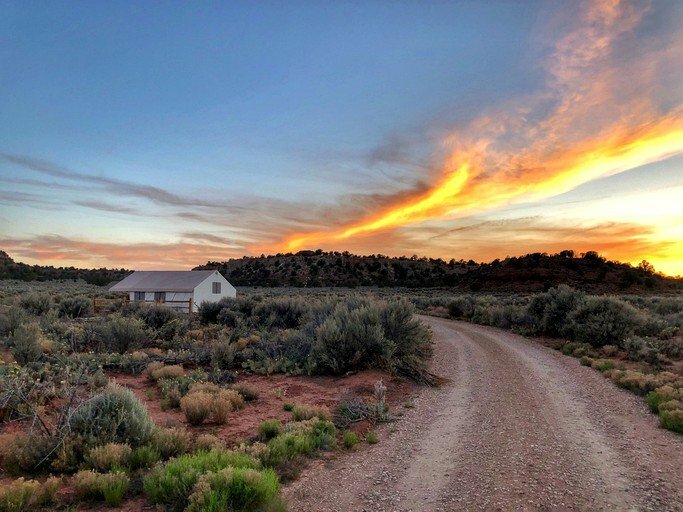 Those looking to dine out, Kanab has great food options, including two grocery stores, a butcher, bakeries, a natural food store and lovely weekend farmers markets. 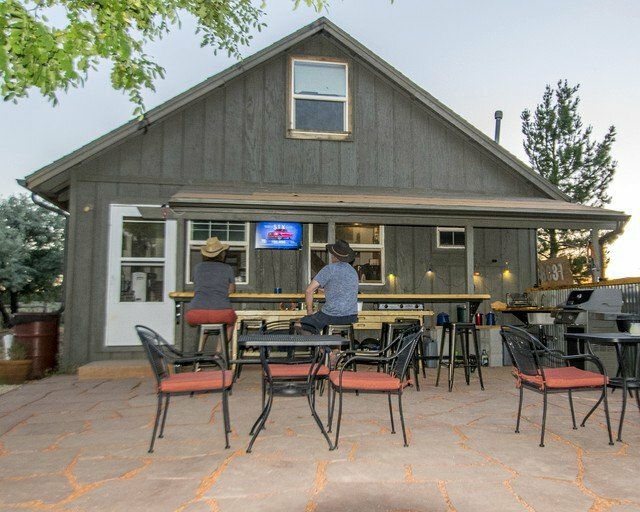 Those looking to enjoy drinks by the campfire, there is a state-licensed liquor store in Kanab for wine, spirits, and micro beers. Utah beer, however, is widely available. The host can neither sell nor serve alcohol; however, guests are allowed to consume their own legal beverages on the premises. For any questions, please contact the host. 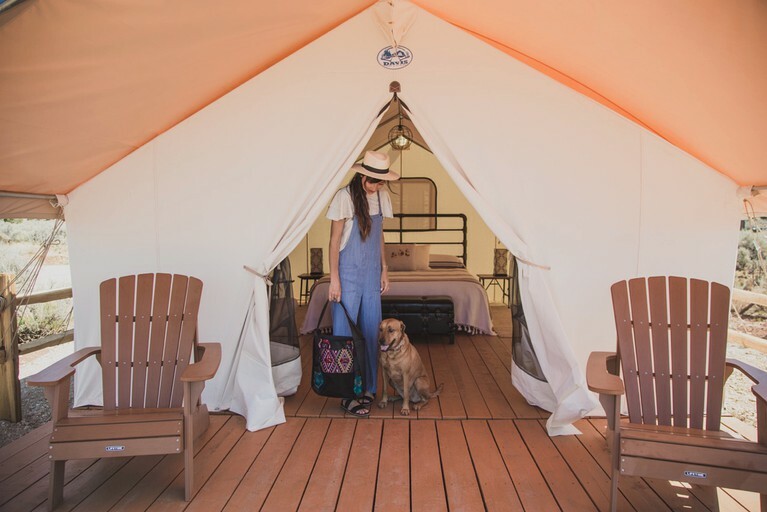 All of the tents are pet-friendly, and pets are not to be left on the premises without the owner present.